Okay, just one more dog post, and I promise I’ll stop. With the dog theme fully in tow, Backyard Mary bloody mary mix features bone-shaped font, three doggy faces on the label and a bottle sizing system inspired by the owners’ four dogs, Chi-Chi, Jupiter, Goliath and Shaq. To be honest, you would have been reading this a lot earlier were it not for a certain someone (ahem, Celery Stalker, ahem) who drank all my mix. But no worries, because the friendly folks at Backyard Mary actually invited me out to their Farmer's Market booth for a more personal tour and tasting. Backyard Mary serves up two different versions of their mix. You’ll find the Premium Blend at various Orange County stores and Farmer’s Markets, while a more bulk produced mix is used at bars and restaurants in Southern California. You can find Backyard Mary at these locations. Hand-crafted by owner Andy Salazar himself, this mix comes in a big glass jar with a hand-written expiration date. The packaging itself won SIP Awards’ Bronze medal for bottle design, and although somewhat awkward to pour out of, the jar could likely be reused and repurposed for other things. Apparently, this type of spout neck style pourer will actually fit onto the jar, so if you have one handy, use it. Backyard Mary offers your choice of Wussy (mild), Happy Spicy (medium) and Mo Hot (hot) in three different sizes. I went with the Happy Spicy and Mo Hot, because, well, I ain’t no Wussy. Here are my conclusions. If you enjoy a super spicy bloody mary, this is it. No sacrifice in quality. No lack of flavor in the name of spice. No spice just for the sake of being spicy. 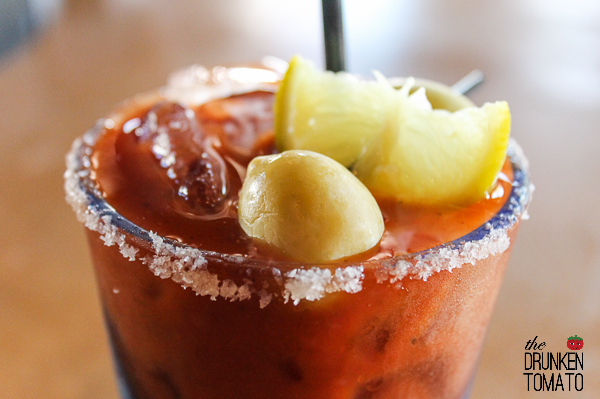 Just a damn good, mouth-scorching bloody mary. I initially thought that the Mo Hot wasn’t actually that much spicier than the Happy Spicy, but it’s that damn sneaky heat that envelopes your tongue like a tube sock of fire. The mix itself tastes pretty much the same as the Happy Spicy, it just happens to be a lot more spicy. Backyard Mary mix is also served at various restaurants in Southern California, including the Shangri-La Hotel in Santa Monica and Posse Bar in Westminster. For this review, I stopped in at Beachfront 301 Bar & Grill in Huntington Beach. While this is technically the Happy Spicy version of Backyard Mary mix, it’s slightly different from the Premium Blend. No fun packaging since it’s really only intended for use at bars and restaurants, and the tomato juice doesn’t quite have the same fresh quality as the Premium. I also usually order my bloodys with salt, which I did here. But I’d recommend you skip it, because the mix is already salty enough. Otherwise, it’s pretty much the same: spicy, savory and perfectly balanced. If your idea of a good time involves burning your taste buds off with a boozy tomato cocktail, I can’t think of a better mix than the Premium Mo Hot Backyard Mary. But even if that’s not your thing, the Happy Spicy and Wussy Premium blend offer a well-rounded, balanced, yet complexly flavored bloody mary. The bar mix is good, but if you can get your hands on it, the Premium Blend is just better. As for the dog theme, it’s been fun, but I’m putting it to rest. Can’t get much better than meeting the seventh generation descendant of “The Beast” from the movie Sandlot. If you stop by the Backyard Mary Farmer’s Market booth, you just might meet him, too.